Mt. Holyoke College Collection, MH 1986.24. 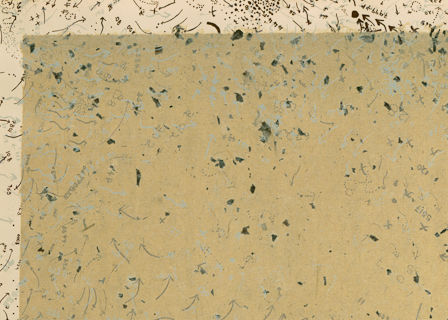 Unlike many of the other pieces in this exhibition, this work by African-American artist Howardena Pindell has no figural—or overtly political—content. 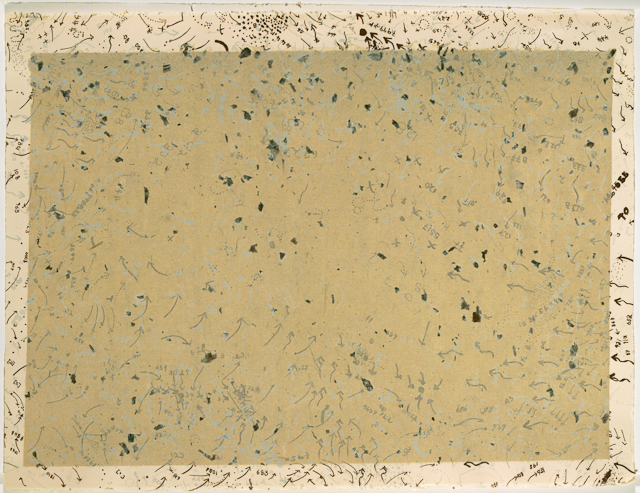 Pindell’s abstract print consists mainly of small arrows, numbers, and otherwise indecipherable symbols. Like the early work of fellow Conceptual artist Adrian Piper, Pindell’s early work is almost exclusively abstract or Minimal in nature and concerned primarily with ostensibly scientific schema. Here Pindell seeks to document the world with a system intelligible only to her; the curvilinear arrows interpenetrate the work’s interior brown border but point towards the empty void at the center of the piece. Though Pindell, like Piper, also makes politically pertinent work that deals directly with issues of race and gender, her inclination towards abstraction in pieces such as this bespeaks an interest in aesthetic ideals that move beyond identity politics. Pindell here challenges notions of simplistically defined “black” art and artists: Untitled resists a colonizing gaze not through direct engagement or subversion but instead by dismissing questions of identity altogether. Pindell here strips away the trappings of subject position in order to focus instead on how the world is structured through facts and figures.